This quilt has been sitting on Sophie’s bed for a couple of months and has already been used, loved, and washed during the warm summer. I backed it with minky fabric, and Kathy quilted it for me with a lovely loose flower pattern so it’s still really soft and hangs nicely. I machine bound it and labeled it with my super professional (and kind of embarrassing! )labeling method. I posted more about this top and the measurements for making the blocks in this post. I love those colors together. And I love that label. Some day that will be a special memento with your own handwriting. This is so pretty and I love the label and the idea of using your own handwriting for them to have with them in years to come. It's beautiful! I love the comforter too! What kind of pen do you use for your labels? Did you write the label with a Sharpie? Or do you have another fabric marker that writes like that? The only marchers or fabric pens I have are Pigmas and they're very thin – or the writing is. I'd love to be able to hand write labels more like yours. So sweet and cozy looking. Lucky little girl. Thank you for sharing ! Lucky little girl ! 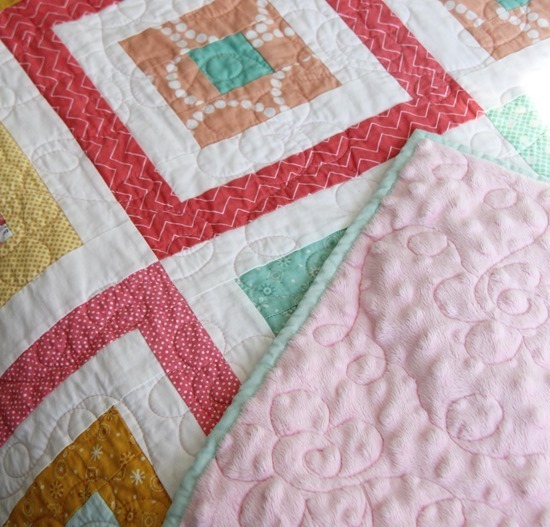 Thank you for sharing this quilt – so soft looking and pretty colors. I actually really love your label as well! Like a previous poster, I've only found very thin pens for fabrics and the writing doesn't turn out well for me. The quilt is very beautiful! The quilt is adorable! What is the cat fabric that you used? I love it! What a great quilt. With 6 grandkids I can see a quilt being made for each of them. Beautiful! I love the quilting, it really sets it off. And the label is wonderful!! 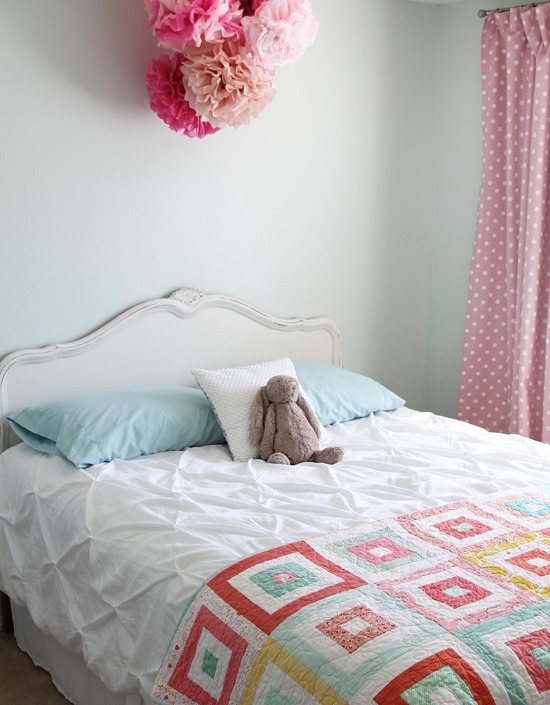 I love the quilt and I also love the white duvet cover. Where did you get that one? I love quilt, beautiful work. What a lovely quilt! I've been wondering how it turned out. I've got that same Jellycat bunny sitting beside me on the kitchen table right now! And as soon as I finish my coffee I'm getting back to piecing square in square blocks I've cut using one of your old tutorials — a quilt for my eldest daughter's bed. Thank you for sharing so much of your knowledge, it's been so helpful to me. The whole room is lovely- do you happen to know the name of the paint color on the walls? 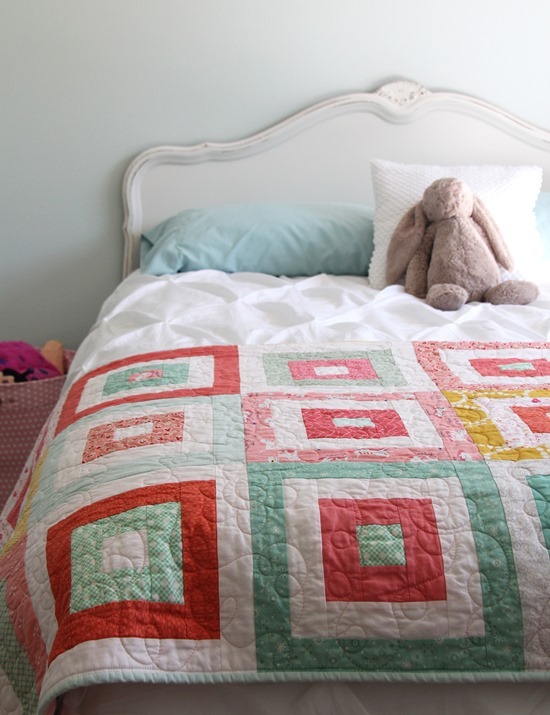 I just finished a quilt with similar colors and now I think I need to repaint my little girls' room! Beautiful quilt. The colors and the pattern are lovely. What pen did you use to label? 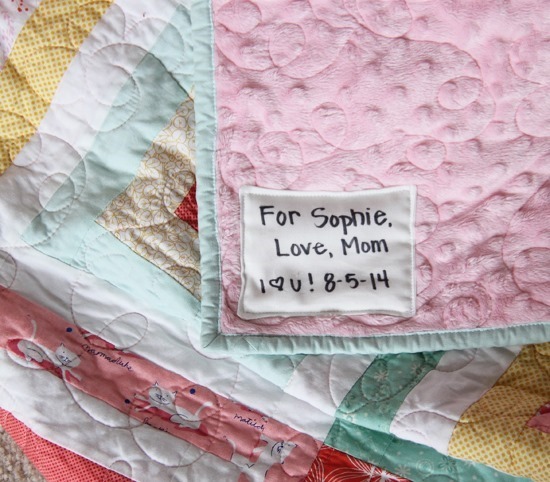 Absolutely darling quilts that you've made for your children. With the minky backed quilts, did you use a batting? If so, what kind. Thanks. Lisa I used a new Sharpie from Office Max…it's a blue package I think? Lynn…this quilt I used a light cotton batting (Warm and White) but if I don't want it to be heavy or it's for warmer weather I leave the batting out. Beautiful! 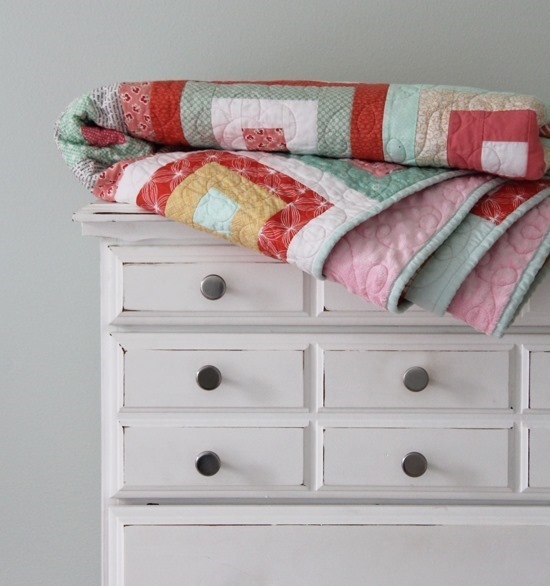 Really interested in the measurements for this quilt but the link is broken! Oh I’ll check that out and fix it! Thanks! it’s fixed…thanks for telling me!